With Wacker Neuson's new dual view dumpers, the operator always has full visibility ahead. When unloading, the operator looks in the direction of the skip, before driving, the operator swivels the seat and console so he is facing in the driving direction. With Wacker Neuson's new dual-view dumpers, the operator always has full visibility ahead. When unloading, the operator looks in the direction of the skip, before driving, the operator swivels the seat and console so he is facing in the driving direction. The system is easy to operate; release the lock, turn the entire operating platform for maximum visibility while working/dumping or travelling. The operator faces forward in road mode for maximum travel speed up to 18.6 mph. The dual-view concept provides a host of efficiency, safety and convenience benefits. All the main functions rotate with the seat so the operator always has the adjustable steering wheel, joystick handle with skip functions, drive direction and horn, the throttle and brake pedal and the multifunctional display in the correct position for working. It is more efficient for the operator to quickly rotate the seat and drive than to use time-consuming maneuvers and fuel to reposition the machine between travelling and loading/unloading. There is an enhanced degree of safety on the jobsite because the operator continually has an optimal view of the jobsite. Additionally, a protection (rock) guard is mounted to the skip to protect the operator's station from material or impact by loading equipment. Wacker Neuson's dual-view dumpers will be available on the DV60, 6-ton, DV90, 9-ton, and DV100, 10-ton models. All models feature hydrostatic drive that offers simple intuitive operation and are available in either canopy or cab versions. The operator's platform has plenty of head and legroom and the multifunctional display includes a rearview camera and lockable anti-vandalism protection. Cab models come equipped with high-efficiency HVAC system and optional fully glazed cab to protect against elements and dust. Designed to save time and money, Wacker Neuson wheel dumpers function like a compact dump truck, but with all-terrain traction and better maneuverability. These versatile, articulated machines feature dumping from the front of the skip or the skip can be rotated 90 degrees in both directions to dump from either side. 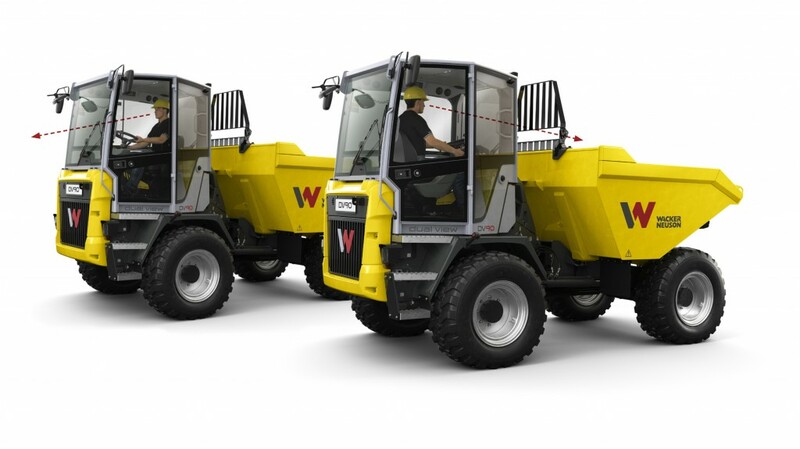 Wacker Neuson's dual view dumpers will be available on the DV60, 6-ton, DV90, 9-ton, and DV100, 10-ton models. All models feature hydrostatic drive that offers simple intuitive operation and are available in either canopy or cab versions.